"Worshipping God the Holy Trinity, proclaiming His Word, and living and serving together in obedience to Him." Church of the Holy Trinity is a Reformed Episcopal Parish of the Anglican Church in North America located near downtown Houston. Our Rector is the Reverend Carl Lund. Please join us for worship this Sunday, the First Sunday after Easter. Our Sunday services of Holy Communion are at at 8:00, 10:30 and 5:00. Nursery Care for children under the age of 5 is provided from 9:30 until the conclusion of the 10:30 Service. Join us on the Facebook link below on Sundays at 10:30 for our live stream. Below is last Sunday’s service. Click here to view our liturgy. Born in Texas, Fr. Carl was raised on the Central Coast of California. He is the father of five children and husband to his wife of 17 Years, Beth. 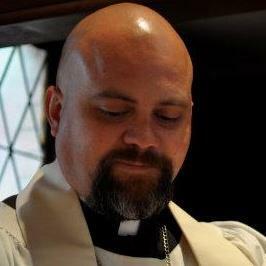 He has served as a minister in the Reformed Episcopal Church since 1998. Fr. Carl enjoys cultivating relationships through the many avenues of fellowship offered at Church of the Holy Trinity. He believes strongly in the point that ministry is the building up of one another in cultivating personal relationships. His passions include preaching, teaching, cooking, grilling, baseball, college football, and his family. He has been credited with introducing grilling meat to the monthly Men’s Pipe Club. (Through this, he has introduced many Texans to his favorite cut of meat, Tri-Tip). His motto for how he sees his ministry is inspired by Bishop Charles Edward Cheney, second Bishop of the Reformed Episcopal Church, who wrote this, "The church to which one belongs is his home. A Christian who is ignorant of his own church, ought to be as rare as the man who knows nothing of the house in which he dwells." Fr. Eric was born in Pennsylvania and grew up in Central Florida. He is a graduate of the U.S. Coast Guard Academy and served in the Coast Guard from 1990-1996, including 4 years in Houston. Shortly after leaving the service, he worked at NASA Johnson Space Center as a contract flight safety engineer (A job he currently holds). It was about this time when he met and married his wife of 16 years, Vanessa. They are the parents of three very active sons and a beautiful baby daughter. Fr. Eric received his Master of Theology degree from Dallas Theological Seminary in 2005, with a concentration in pastoral theology. He loves to preach and teach the Bible, especially in small groups. His interests include reading, basketball, Aikido, and Bible study. Deacon Marshall is a Native Texan, growing up in Copperas Cove. He is an accomplished musician and has played in groups locally and nationally. Dcn. Marshall works for Roadrunner Rubber Corp. as Sales Manager. He is married to Marlyn and has three children and five grandchildren. Music is a vital part of the life of our Parish. Our worship music is guided by the concept of catholicity: believing as we do that we worship with our fellow Christians around the world and with those who have gone before us, it is appropriate to sing songs and hymns from every era of our history. A typical worship service at Holy Trinity will feature hymn selections from the Book of Common Praise, chant, several contemporary worship songs, and traditional and original liturgical music, all arranged for piano, organ, guitar, percussion, and strings. We enjoy traditional harmony for the hymns and pop and folk harmonies for the contemporary songs. Our musicians have written many songs, hymns, and liturgical settings and we will soon be including those resources here. In addition to worship music, we love to sing songs together around the Church patio and in the Parish hall. This is what Sunday morning at Holy Trinity sounds like. We pray it will bless you and direct your heart toward God the Holy Trinity. We provide a nursery for children under the age of 5 during Sunday School and worship. Nursery care is optional and young children are welcome in all our services. The nursery is located in our Education Building and a cry room is also available in the Church. Please ask the usher for details. Jesus said, "I am the Good Shepherd...the Good Shepherd lays down His life for the sheep...I know My sheep and they know Me, just as the Father knows Me and I know the Father." John 10. The Level 1 atrium is a specially prepared environment for young children ages 3-6 where they learn to know and love the Good Shepherd by praying, listening to Bible presentations, and working with related materials. The Level 2 atrium is a place where the 7-12 year old child learns about abiding in God's love. “I am the vine; you are the branches. If you remain in me and I in you, you will bear much fruit; apart from me you can do nothing.” John 15. Using Bible passages, the liturgy, and specific materials made for this age level, the middle elementary child learns how to abide in Christ and grow as a child of God. The atrium is a bridge which helps young children experience more fully the life of the Church through Holy Scripture and the liturgy of the Church utilizing the educational principles of Maria Montessori. Young children have a great capacity to experience God in Christ and Catechists (teachers) journey with the children as co-learners filled with the wonder of God's love.